The family business of Harry Voortman is one of the largest independent cookie makers in Canada. The well-known cookies of the Dutch immigrant are sold across the country. Now, Voortman is a leader in North America in removing trans fats from its products, positioning the cookies as a healthy alternative. Full of conviction, Harry Voortman approaches a customer in the shop at his cookie factory in Burlington, Ontario. “All our products are now free of trans fats,” he tells the man, and grabs a pack of Dutch [ginger cookies] to show him the label. ‘Zero Trans Fats!’ it says in big letters, next to the Voortman Cookies logo, a stylized girl in traditional Dutch costume with the motto ‘traditional family bakery’. Voortman Cookies sells about 30,000 tons of cookies annually on the Canadian and American markets, 120 kinds in total, making it one of the largest independent cookie producers in Canada. Now, the family-run business is a leader in North America in removing trans fats from all of its products, ranging from its popular wafers to chocolate chip cookies. Hydrogenation, the process that leads to the formation of trans-fatty acids, is out of the picture at the Voortman bakery. 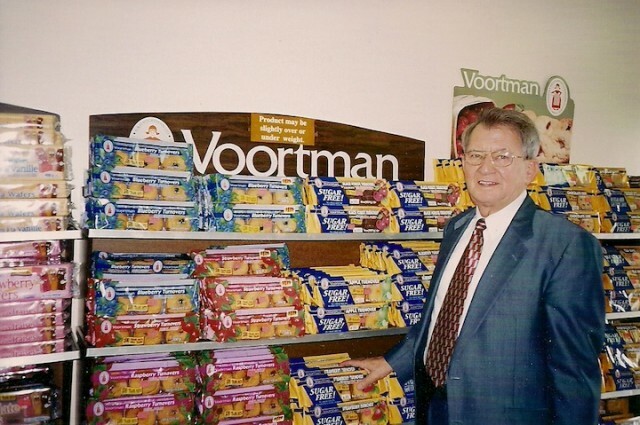 Businessman Harry Voortman in the store at the Voortman Cookies factory in Burlington, Ontario. Voortman is responding to a growing awareness of trans fats among consumers in North America. Although the United States and Canada are not yet going so far as Western Europe, where countries like Denmark have banned trans fats outright, the cholesterol-raising acids are increasingly being questioned. Within two years, food manufacturers in both Canada and the U.S. will be required to list trans fats among the ingredients on the packaging. Voortman decided to jump the gun and stopped using them altogether. With the move, he hopes to position his cookies as a healthy alternative to those of North American giants like Christie and Nabisco, part of the Kraft group. He believes others will follow. Observers agree. “Voortman was the first to announce they were doing it, and that has caused a domino effect,” says Carol Culhane, president of International Food Focus, a Toronto-based consultancy for the food industry. In the 23,000 square meter cookie factory in an industrial area of Burlington, there’s a sweet smell in the air. Over 400 employees bake 20 million cookies per day, on 11 production lines. Forklifts are loading boxes of fudge swirl, oatmeal raisin and peanut delight cookies for transport. Next to the warehouse, trucks are ready to fan out all over the continent. Voortman cookies are on the shelves of all major supermarket chains in Canada. 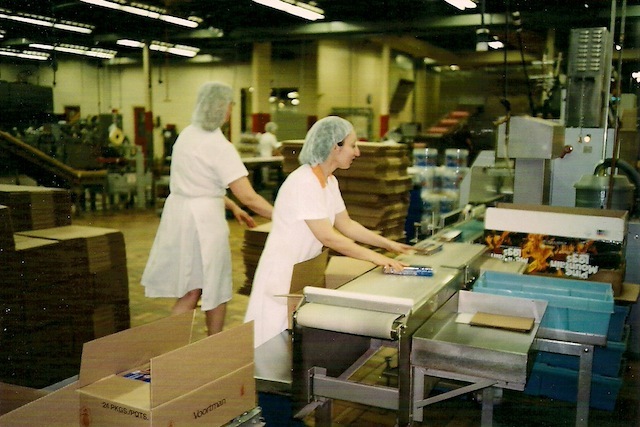 Cookie production line at Voortman Cookies in Burlington, Ontario. Father Voortman had a small bakery in Hellendoorn, then a village of 4,000 inhabitants with 15 other bakers. He was a craftsman who baked all his bread, pastries and cookies by hand. But as a widower with 4 small sons, the father saw no future in his small bakery. After the war, he decided to start a new life in Canada. After working for a while in agriculture – a condition to be allowed to immigrate at the time – Harry and his brother Bill started baking pumpernickel bread in 1951. They didn’t have much success, he recalls. “It’s considered a poor man’s bread here.” Honey cake, modeled on Dutch ‘ontbijtkoek’, was a better seller, especially with the Dutch, Belgian and German immigrants in the area – but it wasn’t a real growth market either, he acknowledges. The brothers got onto the right track when they began baking cookies. They bought a small cookie machine from a Dutch immigrant, to bake ‘speculaas’ – ginger cookies that were recognizable to Dutch settlers in the area. After about five years they managed to expand their distribution to grocery stores in the region. They adapted their products to local tastes by working less with butter, as is customary in the Netherlands, and more with sugar and chocolate. Meanwhile, Voortman also began to export to the United States, starting with states directly across the border such as New York, Michigan and Ohio. The company scored a marketing hit with its so-called ‘Cookie Hut’, a display with compartments containing unpackaged cookies of different kinds. Customers could select their fresh cookies themselves and put them in a paper bag. That caught on, and Voortman conquered a place in American stores, where “shelf space is extremely hard to get,” he says. Today, Voortman mainly ships packaged cookies to the U.S.
Voortman, a private company, now has annual sales of $150 million (Canadian). The home market is responsible for about a quarter of that; Voortman controls about 6 per cent of the Canadian cookie market. The remaining three quarters come from the U.S.
With its own transport company, Voortman distributes the cookies to 525 independent distributors in all corners of the continent. Only the southwestern U.S. is controlled by another branch of the family, from California. The original slogan ‘Dutch-style cookies’ was dropped years ago. Only the windmill cookies (speculaas) and Almond Krunch are still recognizable as Dutch. Verpakking van koekjes bij Voortman, voor verspreiding over het Noord-Amerikaanse continent. The complete removal of trans fats does have consequences for the production process, however. For example, it has turned out that the cream filling of Voortman’s popular sugar wafers does not solidify quickly enough . Technicians are still working to refine the new production process.